All transactions are safe and secure with a reliable history in online purchasing behind each of our associates. Buy the Beast and Belle T-Shirt to own Beauty and the Beast clothing and merchandise. 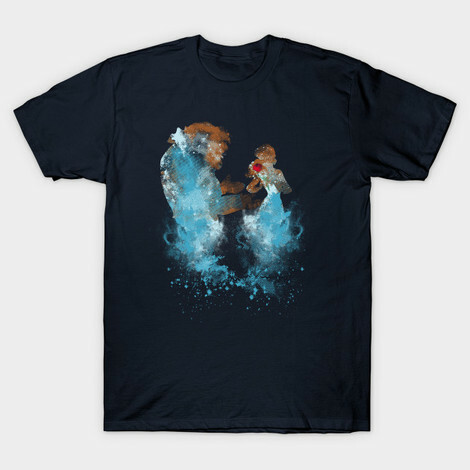 This painted-style Beauty and the Beast shirt for adults features a subdued image of the Beast holding out his hands for Belle, and she in turn is holding his rose. The design on this piece of clothing lets your imagination fill in the rest, including the enchanting love story that the image conveys. In addition to the Beast and Belle T-Shirt above, browse the Beauty and the Beast Clothing Gallery for more apparel like men's and women's clothes, kids shirts or hoodies.